Home » Nutrition » Healthy Eating » Break the Fast! 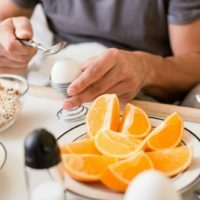 Have you always wondered if it really matters whether or not you eat breakfast? Well, I have an answer for you—breakfast is essential to a starting your day off right! Skipping it altogether can actually be detrimental to your health goals. But keep in mind that it doesn’t have to be a big meal. Even a handful of walnuts and a banana for those who can’t stomach the idea of a sit-down meal can start you off in the right direction. Always include a fiber source at breakfast to start off your day right, help lower-inflammatory processes, keep cholesterol in check and boost satiety (feeling full). A fruit or vegetable provides vitamins, minerals, and phytonutrients, and a lean protein helps with satiety. If you skip whole grains at breakfast be sure to include them at lunch and dinner! Do a color check: did you have blueberries or raspberries for breakfast? If so, aim for green and orange veggies at lunch, or garbanzo or (beige) black beans (black) or kidney beans (brown) with dinner! Comment on Break the Fast!